Lancashire director of cricket and head coach Ashley Giles has signed a new contract to run until 2018. The former England spinner, 43, took charge in October 2014 and guided the Red Rose to Championship promotion and the T20 Blast trophy last summer. Giles replaced Glen Chapple, who had been in interim in charge following the departure of Peter Moores to England. Chapple, 42, and Mark Chilton, 39, have also signed new deals to remain part of the coaching staff until 2018. 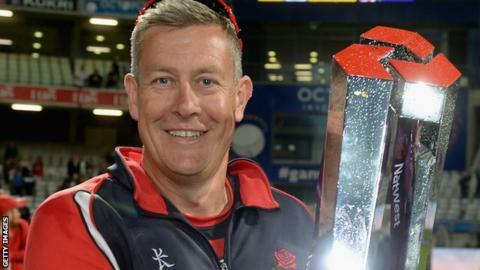 "I've thoroughly enjoyed my first 18 months at Lancashire and feel extremely lucky to have such a strong coaching team around me," Giles told the club website. "We still have a lot of work to do with this young and exciting group of players and we all look forward to bringing future success." Read more on Ian Bell: Warwickshire captain "not thinking about England"